In 1871, Joseph Howland, a Civil War general and former New York State treasurer, whose Hudson River estate (Tioronda) was located a mile south of the then village of Matteawan (later merged with Fishkill Landing to form the City of Beacon in 1913), along with several prominent men of the area, names which are still familiar today: Brett, Mackin, Brinckerhoff, Mase and Van Buren, conceived the idea of building a library, the purpose of which was “to raise the intellectual and cultural levels of people in the community.” Howland, who assumed responsibility for the entire cost of the library, building, books and furnishings, commissioned his brother-in-law, Richard Morris Hunt, considered the dean of American architects at the turn of the 20th Century for his designs of Biltmore House, The Breakers, Marble House, The Metropolitan Museum of Art, etc., to design the the library. By August, 5th 1872, the building was complete and the library, known as The Howland Circulating Library, opened with a formal ceremony and the title of the building was transferred to the library's board of trustees. It remained a library until 1976, when increasing demands on its services compelled a move to larger quarters, a former department store located on the corner of Main and South Cedar streets. The completed building has much in common with the contemporary stick-style summer homes that Hunt designed for wealthy vacationers in Newport, Rhode Island. Some of its elements have been compared to Norwegian Vernacular or Norwegian Gothic architecture. In 1940, a Federal Writers' Project guidebook would describe it as “in the Norwegian chalet style”. The interior was not complete in its current form until late in the 19th century. Except for some necessary upgrades to its various utilities, it is has remained largely intact since then. It was one of the last libraries to use natural light in its main reading room. The original 2,200-volume collection grew quickly, as did its membership. In 1887, electric lighting replaced the original gas lamps. Seven years later, more space was needed, and the upper gallery was added, the last significant change to the building. Some alterations have been made to the heating system over the years, most notably the geothermal heating and cooling system. Even after the village of Matteawan merged with the the nearby village of Fishkill Landing in 1913, forming the City of Beacon, the library remained for paid subscribers only. In the late 1920's, when it was one of only two such libraries remaining in New York State, a wealthy local resident made a bequest to the library on the condition that it become a true public library. In 1942, Nancy Lamont, the second librarian, left the position. She and her predecessor had served a combined 70 years. The library continued to serve the city and its residents from the building until the 1970's, when the growth of the former outpaced the capacity of the latter. In 1976, the library moved to a former department store several blocks west on Main Street, where it has remained to this day and is now called the Howland Public Library. After the library moved to its new quarters, the Howland Cultural Center was established to preserve and protect the historic building, often referred to as "The Jewel of Beacon." The center hosts a potpourri of visual and performing arts, as well as public and community events. It makes the building available for events similar to those it stages itself as well as weddings and parties. In 2007, the Center installed a geothermal system to cut its energy costs and reduce the use of fossil fuels. The system,circulating fluid in vertical pipes dug 450 fifty feet into the ground and connected to ground-source heat pumps, heats the building with seventy percent more efficiency than fossil fuels and cools it forty percent more efficiently than air-source systems. It is also extremely quiet, thus enhancing the building's superb acoustics. This was the first geothermal system installed in the City of Beacon. The building itself is a remarkable two-story three-by-five bay brick structure supported by a foundation of blue stone and granite that had been quarried at the nearby Breakneck Ridge. Its first story is faced in brick, the second in poly chrome fish scale shingles. Atop is a six-gabled roof covered in Delaware slate, pierced by a brick chimney on the west side. On the first story, the building's foundation is capped with a granite table. The east (front) face has arched double two-over-two double-hung sash windows and a central main entrance set in slightly recessed arched panels trimmed with patterns of black and buff brick. The tops of the panels are corbelled. Narrow side panels between the window panels and corners have a simple cross design executed in black and buff brick corresponding to the tops of the window arches. There are six wooden pillars flanking the main entrance supporting a projecting bay on the second story, with a small hood sheltering the wide one-piece granite entrance steps. The second story is set off from the lower level by another water table. Its windows are narrow, tall two-over-two double-hung sash windows above fluted panels. They extend above the roof-line, where they are topped with hipped roofs giving them the impression of dormers. Wood, painted red, trims the shingles. The central window has a tall, narrow, two-over-four double-hung sash. Its face has a half-timbered appearance, although the section on either side of the windows is faced in clapboard rather than stucco. Above it is a two-paned semicircular lunette window. The bay is topped with a steeply pitched gabled roof and finial. On the sides, there are two two-over-two double-hung sash windows in the east bays with a similar treatment as the front windows. Two gables pierce the south face. The smallest one on the north has a two-over-two double-hung sash window with another half-timbered face in the gable. Its larger counterpart on the south has a large paned window of one-over-one double-hung sash with smaller flanking windows. Above it is a tympanum set with intricate tracery. A similar window is located opposite; it has no smaller window closer to the east. The interior of the building is essentially a large, open space. The floors are made of hemlock layered with English cane felt to dampen sound, and topped with strips of Georgia pine. A second-story gallery with a wrought iron railing is supported by carved wooden pillars and wrought iron brackets. Bookshelves are built into the walls and the dado is paneled. The hand-wrought Georgia pine pillars and hammer-beams support a thirty-three, nine inch ceiling. The doors are are carved to look like books with pages rising from the middle when closed. Other rooms include a center entryway and two small offices located on the first floor. There are four rooms on the second floor. They originally composed an apartment for the librarian, but are now used as an office for the Center, a green room for performers, classes for children and storage. The eight-day pendulum clock, located on the balcony, is original to the building. The Howland Cultural Center building was listed on the National Register of Historic places in 1976, the first such listing in the city. Concerts have been held in the Main Room, with its superb acoustics, since the late 1880's and continue to this day, serving the both the City of Beacon and surrounding Hudson Valley communities with concerts of every conceivable genre: classical, contemporary, folk, gospel, new age, rock, etc.. There are also regular presentations of comedy, children's and improvisational programs, live theater, monthly visual and performing arts exhibitions, etc. 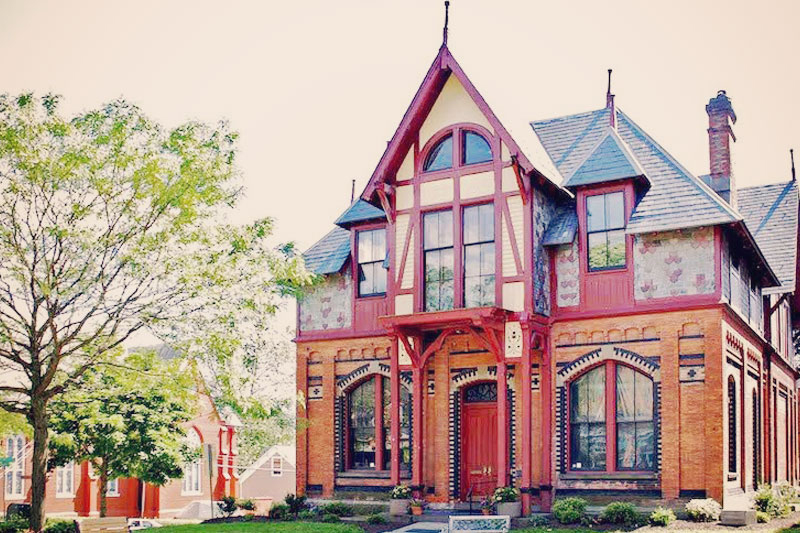 The Howland is currently home to The Beacon Historical Society, The Howland Chamber Music Circle and The Tioronda Garden Club. It is also available as a rental venue for fund raisers, parties, receptions, recitals, weddings, workshops, etc. Long before the revitalization of Beacon's Main Street, The Howland Cultural Center has been at the heart of cultural life, both in Beacon and the Mid-Hudson Valley, contributing significantly to the quality of life. The continuing Mission of The Howland Center is not only to preserve and protect this historic architectural treasure, but to continue to serve the residents of Beacon and surrounding communities with a myriad of cultural events, year-after-year.